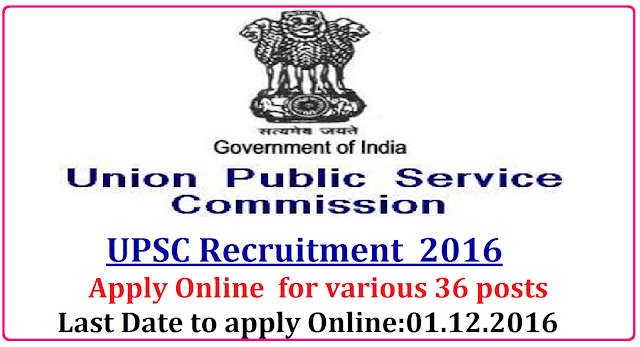 UPSC Recruitment Advt No 20/2016 Apply Online for 36 Posts|Union Public Service Commission (UPSC) has published a notification for Advertisement No.20/2016 to fill 36 vacancies of Deputy Director (Aircraft Engineering), Joint Director General, Assistant Professor and Junior Time Scale (JTS) Grade of Central Labour Service in various departments. Last Date for online registration of application is 1st December 2016. Application Fee : Candidates shall pay application fee charges of Rs. 25/- (Rupees Twenty five). Fee should be deposit in cash at any branch of the State Bank of India (SBI) or Candidates can use Net banking of SBI or Visa/Master's Credit/Debit card to pay fee online.